Secure Quorum: Is Your Company Ready for a Crisis? Unfortunately, tragic events in recent memory have illustrated the crucial need of efficient and effective response in times of emergency or crisis. The stakes are high, time is at a premium, and mistakes are compounded. This is the reason companies big and small, governments, and crisis response teams have continuity plans in place – plans that keep the organization running in case of emergency. These plans, created and practiced well in advance, can save time, resources, and lives. 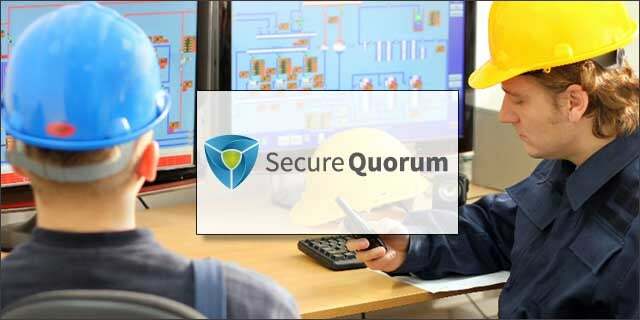 Secure Quorum created their secured alert notification and conference call solution as a conduit for companies to enact their continuity plan. Like the business’s continuity plan, companies create Secure Quorum multiple incident response plans. For each incident, companies select and provide contact information for the key personnel that need to be alerted and consulted if that specific incident occurred. Each individual user, then, creates two PINs and a personalized voice message. The first PIN is used to connect to the Secure Quorum conference call, while the second PIN is used to approve and authenticate transactions during the incident. During the incident, each assigned user in the Secure Quorum application must enter their transaction PIN to approve and carry out transactions, like moving funds from a compromised account or paying for services need to rectify the crisis at hand. The personalized voice recording is used as another layer of security, so that the users receiving the conference call can be assured of its legitimacy. During an incident, starting the application will prompt the user to answer specific questions related to the incident, questions that the user’s company predetermines according to the nature of the incident. These questions will ask for the pertinent information of the crisis, so the information can be used as quickly and efficiently as possible. This information is then sent directly to the appointed individuals before the conference call, assuring that each member of the team has the pertinent information as soon as possible. Secure Quorum’s solution focuses on the two important needs of crisis management: security and information. By using the Secure Quorum application, companies can prepare and structure their response to incidents in the same interface that is used to alert and automate the conference call in response to the incident. This streamlined approach affords companies extra time in moments of crisis, time that is better spent handling the crisis than trying to reach key people. Secure Quorum was a showcased startup at our Tech Cocktail Dallas mixer. On International Women's Day, we recommend five simple actions we can all take to help improve gender inclusivity in the tech industry, which still has a long way to go to close the gender gap. Guide: What Is Samsung MicroLED? MicroLED is the latest innovation in TV technology, and it just took another leap forward at CES 2019. How does this new tech work and when is it rolling out to every-day consumers? Here's what to know about the bright-lit, inky-black future of TV tech.